This was a custom order and I just absolutely love the result! Amy Butler's fabrics are so nice! I love the designs and could stockpile my fabric stash with her things alone. Anywho, it turned out well - super cute! Another awesome Natural Mommie Giveaway! Look at this awesome giveaway!!! 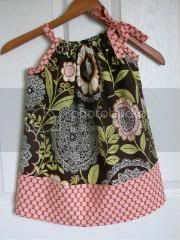 Just listed a new dress! New in shop - Special for Introduction!